The famous cat from the Italian fairy tale, Puss In Boots, made by Hermann Teddy! From United StatesBrand: HermannSize: 12in. Gorgeous pale pink mohair plush Hermann Spielwaren Coburg Hanami Cherry Blossom Teddy Bear. Hanami is the Japanese word for cherry flower. Pink and dark pink felt blossom flowers around ear. ultra rare vintage antique miniature teddy bear HERMANN MOHAIR steiff gold 5"
Gently loved 1994 Hermann bear - I believe he is mohair but I can't confirm that. He stands about 15" tall to the top of his ears and about 21" to the top of his hat. He wear a lovely dark blue "velvet" robe with border of dark blue with silver stars and dots, and matching hat. This 15" jointed bear is 70% acrylic/modacrylic and 30% cotton. The eyes are plastic and the nose is stitched on.Includes ribbon around neck as shown in main photo. Used for display only. “Growler” works as should, no noted flaws. She is wearing the green satin collar I found her in, but it appears quite oversized and so I don't know if it is original because I can find no pictures online of this particular bear. She is in excellent clean condition throughout with no issues. Top Rated SellerFrom United StatesBrand: HermannSize: 12in. 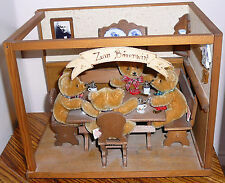 GERMAN HERMAN MOHAIR BEAR. He is the Centennial Bear Nr. 13 7 out of 1000. No box, not sure there was one. Excellent condition. THERE ARE A LOT OF PEOPLE TRYING TO GET INTO YOUR POCKETS WITHOUT PROVIDING THE GOODS. Lovely Teddy Hermann Original Crocodile. It is a soft plush toy made in Germany. Length is 21.5" or 55 cm and 5 " high or 13 cm. Stuffed with. Like new condition. Very nice and clean without stains or funny odours. He is adorable, and in excellent condition! His growler works fine when you turn him and is nice and loud! There are no holes, no stains and no wear on his mohair! He has never been played with or displayed. TEDDY HERMANN MOHAIR 15" GROWLER BEAR LIMITED EDITION LOW #8 OF 500, NICE! Pre-owned Hermann mohair bear in like-new condition. This is the 13th Sonneberg Museums Bear from 2006. This is bear #8! Moving arms and legs with working growler! 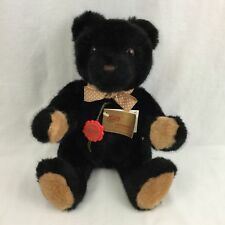 2003 Hermann Annual Pin Bear. cute little purple bear with a pink bonnet and pearls. Julie Good Kruger Dolls. Made of Golden Mohair. Limited Edition: 474 of 1000. Old Fashion Bear. Bear "laughs" when shaken. Size: 40 cm. We want your item to arrive promptly and safely. We do the work. From start to finish, we do it all. This is a very nice fully jointed, mohair Hermann Nostalgic Teddy Bear, made in Germany. The size is 5”/14 cm, and the Hermann color is Old Gold. The Hermann Item Number is 16314 5. 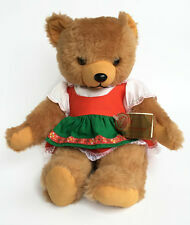 Collectible Max Hermann Oktoberfest "15" Jointed Soft Mohair "Musical" Teddy Bear. I believe he is a Hermann Bear #62-20 from the 1981 inventory our Mom had but I am not 100% sure of that. To find one in such good condition is a real treasure! He would be a great addition to your Hermann or German mohair collection or would make a wonderful gift for a collector. This bear is approximately 14" tall, has Jointed arms and legs and a movable head. He has glass eyes a well stuffed body making him very stiff and has mohair on the outside with cotton. He is in excellent condition and has a sound Box in him that makes noise when you move him up and down. Fully jointed, long gold colored mohair, with shaved muzzle. He is missing his violin, yet still has his bow. He has been kept in wonderful condition and plays "The Blue Danube Waltz". Martin and Ursula Hermann, the grandchildren of Max who started making Hermann bears in 1920 continued making bears. HE IS IN GOOD CONDITION, HE DOES HAVE A SMALL HOLE IN HIS FOOT PAW, TUX IS A LITTLE DUSTY. NO BOX OR CERT. ALL PROCEEDS GO TO ANIMALS IN NEED. KING LUDWIG II OF BAVARIA MOHAIR BEAR BY HERMANN BEARS. LONG MOHAIR. VELVET EMBROIDERED PAWS. WEARING A FAUX FUR CAPE AND VELVET CROWN. I HAVE OWNED HIM FOR YEARS. I AM SCALING DOWN. Piglet is wearing a sailor cap and collar and he has glass eyes. Handmade in Great Britain Limited Edition by Gabrielle. Approx: 9" Disney Convention Pooh bear. This gorgeous Pooh is number687 out of only2500 pieces made. He will make an incredible addition to any collector and a very special gift for a Pooh lover. Designed in 1995 by Biggi Netzel, made of English Mohair. No. 107 of 500 pieces. GANZ Teddy Bear lot of 3 bears. Two Vintage Mechanical Yes No Teddy Bear MISTY . Moves her head up and down or side to side while moving tail. Has posible arms. one has tags and one is listed Used condition with no tags. And the third bear is also a Ganz brand from 1998. Shipped with USPS Priority Mail. All bears are wearing shoes or some sort of clothing not all original, but from a collectors collection of dress up bears. Panda Teddy Bear by Teddy Hermann - limited edition #255 MILLENNIUM 1999. Made of pure Mohair. And is in Mint/Pristine condition. His crisp, clean uniform has a velvet feel. Along with a white belt and shiny buckle. The black fur Guardsman hat and iconic white tuft of fur atop it finish off his majestic uniform. C1960s to 1970s. One has had an ear restitched to his head. Hermann Original Teddy. Dates c1960s to 1970s. No missing mohair, no thinning mohair. Unjointed, in the standing position, made from golden/orange/yellow mohair, with dark spots on his skin (backing fabric), coarse black mohair mane, peach velvet ear lining. HERMANN TEDDY ORIGINAL. TEDDY BEAR. RED RIBBON. I SAY USED BECAUSE I AM NOT THE FIRST OWNER. PICTURES SAY IT ALL. COLLECTOR PIECE age 14 or older. 47% Cotton. Very nice Hermann fully jointed, mohair Nostalgic Teddy Bear with a growler. The Bear was made in Germany and the size is 15”/40 cm, and the Hermann color is Old Gold. The Hermann Item Number is 16340 4. Mercedes Benz Plush Bear Teddy Hermann GmgH Hirschaid Germany Brown Scarf 14"
Made by Teddy Hermann GmgH in Hirschaid Germany. Adult owned, very clean, no flaws. Designed by the award winning artist Ulla Hermann,granddaughter of the founder. Made of valuable German mohair. Little Red Riding Hood. 200 Year Anniversary of Octoberfest - 2010. Hermann Original. Teddy Bear. Plush Stuffed Toy. Limited Edition. Local pick up is available in the Fort Lauderdale FL area. With original delivery box & plastic. Made in Germany, from Collection 2000. Limited edition for the 80th anniversary of the green tag. Holding wooden toy, working growler, mohair plush, excelsior filling. 983/1000 15.4” Great piece for your collection! Hermann Spielwaren 80th Anniversary Mohair Bear- Limited Edition. Condition is New. Shipped with USPS Priority Mail. The mohair is in very nice condition. They naturally show wear from age and use. It will make an excellent display or addition to any collection. She is 3rd in the series of Hermann Flower Bears and is numbered 214 out of only 500 pieces made. The bear is used, but still in very nice condition. I do strive to note any and all flaws, but I don't always catch everything. Top Rated SellerFrom United StatesBrand: HermannSize: 14in. Hermann Teddy Sammy. Hermann Teddy Original. 100% Mohair. No Mohair Missing. nr 441 / 2000. & Heart Pendant. in the original condition for our collectors. makes them no longer original or authentic. Hermann 17" Albrecht Duerer Mohair Bear w/Rabbit Limited Ed. 374/1000 MINT. Limited Edition to 1000 worldwide- this is #374. We will do our best to describe and test every item. Mint condition- acquired from the original owner. Working Growler. Shorter mohair lined ears and muzzle. White felt paw pads. Ending 26 Apr at 20:31 EDT6d 15hTop Rated SellerFrom United StatesBrand: HermannSize: 11in.